It would probably be an understatement to say that the last year or so has been a turbulent one for Ghost. Although it’s more or less been an open secret for some time now that Swedish musician Tobias Forge was the, uh, “face” of Ghost by way of the various iterations of his Papa Emeritus character, it took a lawsuit by former members of the band to fully unmask him and, in doing so, threatened to completely dissolve the mystique Ghost has painstakingly built since their mysterious arrival on the scene in 2010. Undeterred, Forge is back with a new persona—the spritely Cardinal Copia—and appears more than ready to further propel Ghost towards new frontiers on their newest album entitled Prequelle. Long after having been branded “NOT REAL METAL” by grumpy traditionalists, Ghost’s last two releases—2015’s full-length Meliora and 2016’s Popestar EP—strongly hinted that they were perhaps gearing up for an assault on the poppier end of the rock and roll spectrum, and if we can agree that that is true, then Prequelle is basically Ghost holding a chloroform soaked rag over the face of the mainstream while whispering in its ear, which is to say: if you hated them for their accessibility before, it’s probably best to just stop reading right now. In keeping with past releases, Prequelle starts off with a brief but eerie intro called “Ashes” before abruptly launching into lead single “Rats”—a song which wastes no time in codifying the album’s thematic and sonic underpinnings. Forge has stated in interviews that he wanted “Rats” to be a big, garish, show-opener of a song, and in that regard he has succeeded. Mark my words, you’re gonna hear a lot more of “Rats” before we put a bow on 2018—whether you want to or not (note: “Rats” just hit #1 on the Billboard Mainstream Rock Songs chart). This is likely (hopefully) to be the case the with the track that follows as well, an insta-classic called “Faith” which is the album’s most aggressive track and briefly flirts with progressive metering before morphing into a straight-up foot stomper. But lest you think Prequelle is all bluster and bravado, the album features a couple of tracks that delve into what I would argue is quickly becoming the hallmark of the Ghost sound—and truly the attribute that makes them special—which is Forge’s ability to write songs that are lush, urgent, and beautifully pensive. The first of these songs, “See the Light”, juxtaposes sparse piano-driven verses against driving, stuttering chorus riffs, while the latter is an absolute gem called “Pro Memoria”—a song which pulls out all the stops in an effort to permanently worm its way into your brain by way of sinister synths, inspired piano playing, and a glorious vocal hook. Speaking of instrumentation, Prequelle is easily Ghost’s most robust and fleshed-out offering to date, as is readily demonstrated on Prequelle’s two instrumental tracks, side A’s “Miasma” and side B’s “Helvetesfönster”. “Miasma” is a rambunctious little ditty, largely driven by guitar, synth, and a truly badass saxophone solo! “Helvetesfönster”, on the other hand, leans almost entirely on the opposite end of the dynamic spectrum, and as Prequelle’s longest track, guides the listener through a range of movements culminating in an absolutely gorgeous acoustic guitar passage featuring fellow countryman and Opeth mastermind, Mikael Åkerfeldt. I’ve gone all this time without mentioning the album’s centerpiece, the impossibly catchy “Dance Macabre”, a song which is likely to be a tipping point for a lot of people who were previously on the fence when it comes to Ghost. But I’m going to go out on a limb here and assume that when you, dear reader, clicked on this review, you probably did so with a fully formed opinion of Ghost. And that’s fine! Me? Well, the honest truth is that I have a hard time squaring my love of Ghost against my generally held views concerning music. I’ve never been a big fan of novelty acts or bands which require costumes and/or ham-fisted personas to sell their product, and the thing I loathe most about the metal genre is its over-reliance on grotesque and/or blasphemous imagery. 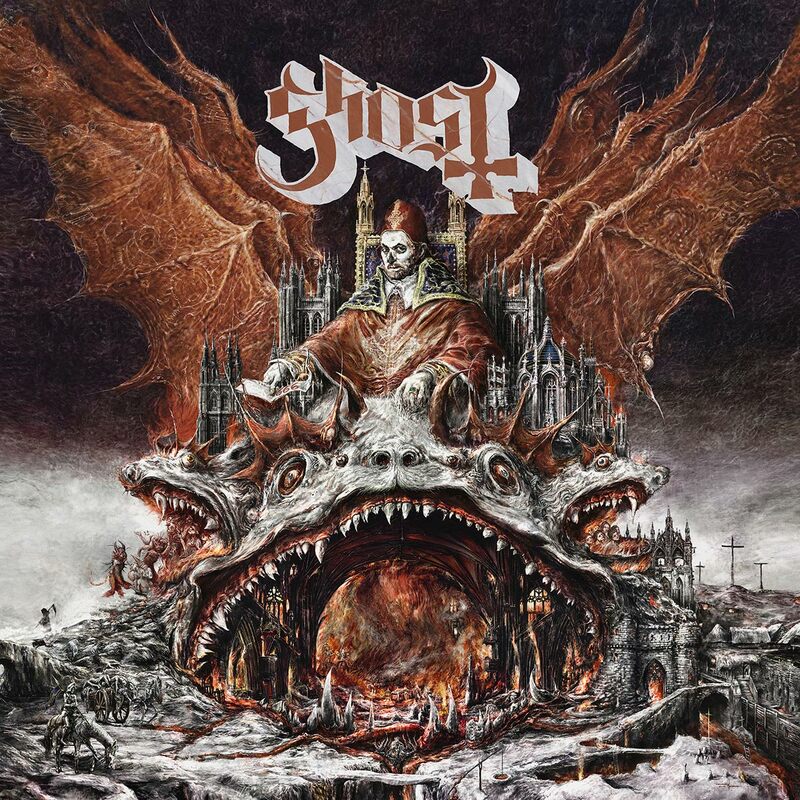 But for some reason I can’t get enough of Ghost, and I love the direction they’re going on Prequelle. Maybe it’s because it amuses me to no end that card-carrying metalheads get all red in the face at the mere thought of a band like Ghost achieving the success they have, but the more likely explanation is simply that Tobias Forge writes killer songs, and even though he’s undeniably built Ghost upon farcical foundations, he possesses the right combination of self-awareness, talent, and wit to pull the whole thing off expertly. I can’t think of a single second of Prequelle that I don’t thoroughly enjoy and I, for one, can’t wait to watch Ghost burn the stagnant world of mainstream rock and roll right down to the ground.